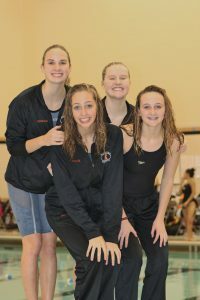 In 2016, Rockford’s girls swimming and diving team capped off a four-year long run of OK-Red dominance by taking the Division I state championship. This season, the Rams will have to focus on the state championship meet after dropping the first OK-Red championship meet since 2012 to West Ottawa. 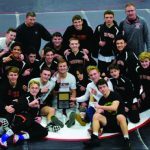 The fifth-ranked Panthers flexed their muscles in the battle of state powers, posting a total of 488 points to best fourth-ranked Rockford’s 446.5. The meet was blazing fast, with 10 new pool records, six new conference meet records and one Rockford school record set. Some of the winning times would be among the top-10 all-time performances at the Division I state meet, a list that includes multiple former Olympians. “West Ottawa is deep and very, very fast,” Rockford coach Tom Parks said. “We knew it wouldn’t be easy. The Rams were within striking distance most of the meet, but held the lead just once, 275.5-273 after the 100 freestyle. Rockford edged West Ottawa in consecutive events to recover from an early deficit and take the lead. Junior Morgan Kraus started the push with a win in the 100 butterfly (54.80), with sophomore Rachel Gamm (second in 58.69) and seniors Ashley Duimstra (8th in 1:04.23) and Alyssa Frizzo (16th in 1:07.09) combining to pick up 13 points on West Ottawa. Rockford followed that by placing four swimmers in the top 11 in the 100 freestyle, led by Peyton Rayburn in second (52.55). Sophomore Sam Knepper (fourth in 52.76), senior Erin McDowell (t-sixth in 54.52) and senior Anna Mixon (11th in 57.43) recovered another 7.5 points from West Ottawa, giving the Rams the lead just past halfway through the meet. West Ottawa followed by posting a strong 500 freestyle, with four swimmers placing 5-8. Rockford sophomore Masy Folcik took third in 5:12.05, with sophomore Ally Kinstle (13th in 5:43.09) and seniors Hailey Gates (15th in 5:48.60) and Frizzo (16th in 5:51.13) also scoring points for the Rams. The Panthers held a 24.5-point lead going into the 200 freestyle relay, but the Rams were nipping at their heels. 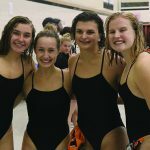 Rockford needed to make a move, but the 200 freestyle relay was a reflection of the meet. After a close start, Rayburn, Gamm, sophomore Sam Knepper and Kraus forced their way back into the race only to get out-touched at the end. West Ottawa set a new conference and pool record of 1:35.34, nosing out the Rams, who finished second in 1:35.41. 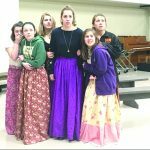 “It was really tough for the senior class this year,” Parks said. “It’s hard to follow up a state championship team and compete at the same level. They were really hard workers and phenomenal leaders. Rockford closed the meet out in style, with Knepper, Folcik, Rayburn and Kraus setting a new conference meet record (3:29.21) in the 400 freestyle relay. Kraus also won the 50 freestyle in a school record 23.38 seconds, while Knepper took third in 24.11. Freshman Paige Beers took 11th in 25.94 and Mixon finished 13th in 26.14. The OK-Red Conference is loaded, with five teams finishing in the top 20 at the Division I state meet last season, and each of those schools placing at least third or better in an event at the state finals. 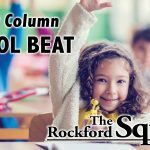 Despite the depth, Rockford’s top finisher managed no worse than third in any event, winning three and placing second six times. Rayburn took second in the 200 freestyle (1:51.11) and Gamm took fourth in 1:57.87. Folcik finished third in the 200 individual medley in 2:10.12 and freshman Sara Kraus finished sixth in 2:13.98. Junior Ram diver Elise Jendritz finished second with 420.30 points behind Grandville’s Gracyn Segard with 461.10. McDowell posted the best Rockford finish in the 100 backstroke in 59.44, with sophomore Sabrina Boss placing sixth in 1:02.97. Ram sophomores Kraus and Kaleigh Blockland took third (1:07.76) and sixth (1:10.65), respectively, in the 100 breaststroke. Morgan Kraus and Rayburn led the Rams contingent earning all-Conference awards, joined by Folcik, Gamm, Knepper, Jendritz, Sara Kraus and McDowell. Hudsonville finished third with 342 points, followed by Grand Haven (311), Grandville (278.5) and East Kentwood (98). 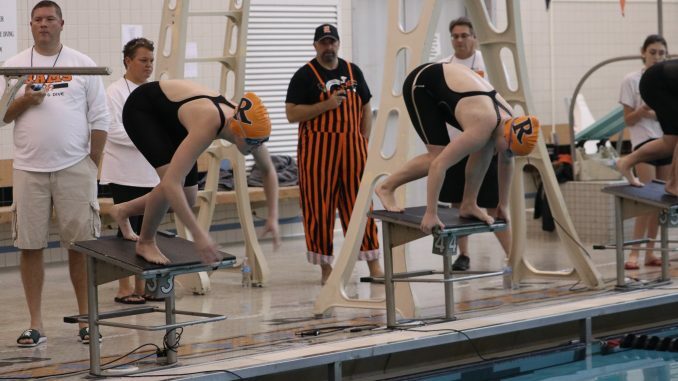 Ranked 12th nationally in dual-meet rankings by the National Interscholastic Swim Coaches Association, Rockford heads to the state meet knowing Mercy (ranked 11th nationally), West Ottawa and perennial powers Saline and Ann Arbor Skyline are waiting. The Division I state meet will be held Nov. 17-18 at Oakland University, while the Division I diving regional will be held at Zeeland West Nov. 9.